Let’s dance together, let’s drum together, let’s sing together with Feraba. Join Ibrahima Kolipe Camara, a native from Guinea, West Africa and Irene Koloseus, dancer and choreographer as they celebrate Black History month. 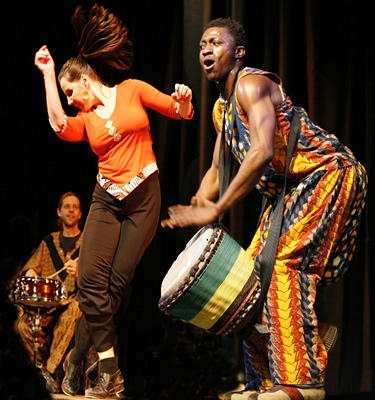 The two perform dances, rhythms and songs from Guinea as well as honoring tap dance – an art form – created in America. Learn how American tap dance has its roots in African music and dance. Join the fun during this highly interactive performance! African “shakers” and small drums will be provided for toddlers, youngsters, and their families. Events for Youth & Families are made possible through generous support from the Estate of Pearl S. Reuillard in memory of her parents Yetta and Louis Schwartz.